Over the past two decades, the Liberty Awards have honored corporations, law firms and individuals whose work exemplifies the highest standards of service and commitment to the LGBT community. (New York, NY– April 13, 2015) – Lambda Legal announced today that Jesse Tyler Ferguson, five-time Emmy-nominated actor and LGBT advocate, will accept an award at its 29th Annual National Liberty Awards on May 4, 2015. 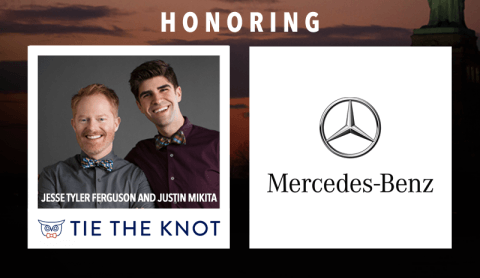 Lambda Legal is recognizing Tie The Knot, founded by Ferguson and his husband, Justin Mikita, as well as Mercedes-Benz USA. Tie The Knot advances the freedom to marry for LGBT couples through the sale of limited edition collections of neckwear and other fashion accessories, sold exclusively at TheTieBar.com/JTF. Using a fun play on words, Ferguson and Mikita founded Tie The Knot to raise awareness and advocate on behalf of LGBT equality throughout the world through the release of limited edition collections of neckwear and other fashion accessories. Tie The Knot’s debut bow tie line, which launched in November of 2012, sold out in less than four weeks. Each collection of ties features a single bow by a celebrity guest designer who lends their voice to the fight for LGBT equality. As a part of Tie The Knot’s public education efforts, the organization held a Bow Tie Lobby Day in January of 2013 in Springfield, IL and joined with then-Gov. Pat Quinn, then-Lt. Governor Sheila Simon and members of the public as Illinois’s marriage equality bill came to a vote—and passed—in committee. Additionally, Tie The Knot joined forces and held events with leading LGBT advocacy organizations to support successful marriage equality lawsuits in New Mexico and Utah. Also at the National Liberty Awards, Lambda Legal will recognize Mercedes-Benz USA (MBUSA), a Lambda Legal National Sponsor, for its consistent efforts to provide an affirming work environment for their LGBT employees. With a commitment to diversity and equality demonstrated through LGBT-inclusive employee policies and corporate culture, MBUSA leads by example. By fostering equality internally, and partnering with organizations like Lambda Legal to promote it publicly, MBUSA is truly a corporate leader for LGBT people nationwide. Tommy Shi, Esq., Diversity and Inclusion Officer, will attend and accept the award on behalf of MBUSA. Lambda Legal is proud to highlight Mercedes-Benz USA for the company’s commitment to their LGBT employees. Having a safe and supportive work environment is the kind of real world, lived equality that Lambda Legal strives to achieve through our legal and education work, and Mercedes-Benz does just that, said Kevin Cathcart, Executive Director of Lambda Legal. The 2015 National Liberty Awards will be held Thursday, May 4, 2015, from 6:00 pm – 9:00 pm at Pier Sixty, Chelsea Piers, 62 Chelsea Piers, New York, NY 10011. For ticket information, visit www.lambdalegal.org/libertyawards or contact the Lambda Legal benefit office at 212-249-6188. The 29th Annual Liberty Awards Dinner is Lambda Legal’s premier national event. Attracting individual and corporate supporters from the New York metro area as well as from across the country, the event annually raises $1 million for Lambda Legal. Over the past two decades, the Liberty Awards have honored corporations, law firms, and individuals whose work exemplifies the highest standards of service and commitment to the LGBT community. Tie The Knot keeps an active blog on its website with up-to-date news and developments throughout the country. Tie The Knot’s active social media presence across diverse platforms informs its audience of over 30,000 followers on the progress being in the LGBT equality movement. You can find Tie The Knot on Facebook, Twitter, Instagram, Tumblr, Pinterest, and YouTube (/TieTheKnotOrg). MBUSA is also responsible for the distribution, marketing and customer service of Mercedes-Benz Sprinter Vans, and smart products in the U.S.
More information on MBUSA and its products can be found at www.mbusa.com, www.mbsprinterusa.com and www.smartusa.com.